Dirty Jobs host Eagle Scout Mike Rowe addresses a crowd of more than 50,000 Scouts, Venturers, and guests at stadium show. Photo by Daniel M. Reck. "It's okay to get dirty. The dirt washes off. 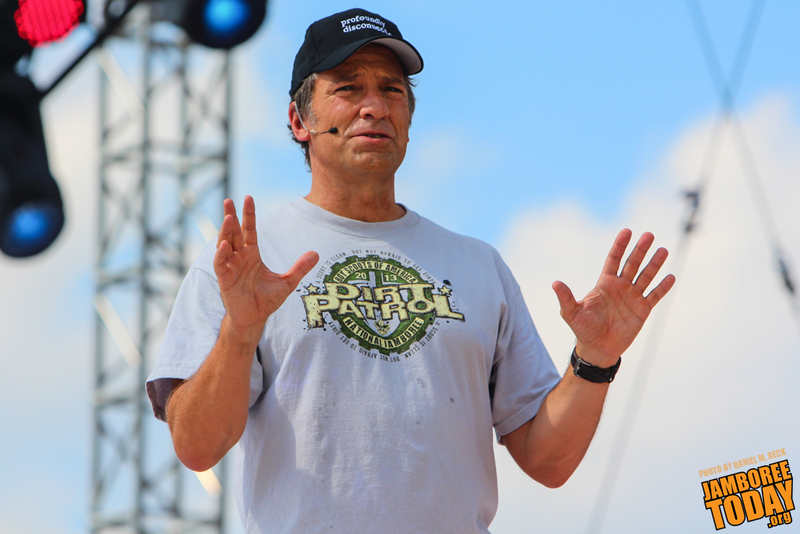 The dirt's the thing that keeps us connected," said Eagle Scout Mike Rowe at this afternoon's 2013 National Scout Jamboree stadium show, which left a crowd of over 60,000 Scouts, Venturers and visitors inspired and excited. Rowe, known for being the host of Dirty Jobs with Mike Rowe on the Discovery network, told Scouts that getting your hands dirty, working hard, and learning a skill will always pays off. "Work smart and hard. You can't separate hard work from smart work" he said, which lit up Facebook and Twitter with a flurry of activity from the audience. "Mike Rowe is here at the #2013jambo My life is complete," said Yoyoyoman35 on Twitter. Another inspiring Eagle Scout, Army Col. Lawrence Dahl, presented his experience as a Wounded Warrior and in Scouting. "It gave me the skills that helped me save someone's life. It helped make me a better soldier. Scouting helps you be prepared for whatever life throws at you,even if it's not pleasant." he said. "Scouting will lead you on for the rest of your life." AT&T CEO Randall Stephenson also addressed the audience about the future of Scouting. "It is only going to get better from here. This event...this is only the beginning," he said. "This is a reboot of the Boy Scouts of America. This is our new beginning, folks." Stephenson introduced King Carl XVI Gustaf of Sweden, who greeted the crowd enthusiastically. "I am a king, but I am also a Scout," His Majesty said, standing before the audience in his Swedish Scout uniform. After recognizing the Swedish Scouts in the crowd, he led the assembly in a cheer involving swinging hands in the air, stomping feet, and making a great swishing sound before erupting into a yell. The King is known for his kindness and warmth. When his nation hosted the World Scout Jamboree in 2011, Jamboree Today's Daniel M. Reck reported that he dined with jamboree staff in their dining hall and camped among the Scouts. "Do all the crazy things that you have dreamed of," His Majesty said, smiling broadly. 3 Doors Down took to the stage to perform a set of chart-topping hits, including "Here Without You," "Kryptonite" and "When I'm Gone." The band was formed in Escatawpa, Miss., and boasts platinum-selling records. They have a commitment to charity with The Better Life Foundation, a non-profit that aims to improve the lives of children in need of things like food or medical attention, according to their website. AT&T Summit Stadium was energized by their alternative rock rhythms and vocals, which had nearly all on their feet as beach balls sailed through the air, bouncing along the raised hands. Many of the beach balls have been signed by the Scouts and Venturers in the audience as they have been passed around. "Mike Rowe, The King of Sweden, and 3 Doors Down....This is a pretty awesome and diverse closing" said jcler55 on Twitter.